A stubborn fixture on the popular music scene for over 4 decades, David Bowie was one of the few performers to build a career on stylistic inconsistency rather than creating a predictable output. Making periodic zigs and zags between contemporary trends and fringe movements (and at times straddling both simultaneously), Bowie managed to establish both a mainstream and a cult following for himself, with the distinction between the two becoming progressively more blurred over the years. Whether this has been a calculated move or simply the promptings of musical wanderlust, it has effectively served to maintain his relevancy in a fickle industry, regardless of his current status on the charts (and in spite of occasional ill-advised concessions to the same). Born in the South London suburb of Brixton, David Robert Jones spent most of his pre-adult life living in Beckenham; it was here that he developed an interest in becoming a performer after being exposed to jazz, R&B and early rock and roll by his older half-brother Terry. In his early teens he took up the saxophone, motivated by the dream of someday earning a place in Little Richard's backing band, and later found himself assuming the role of vocalist. After graduating from Bromley Technical High School at the age of 16, Jones began earning a living as a commercial artist for advertising agency, while keeping active after work with various London-based bands such as The Konrads, David Jones and the Buzz, The King Bees, The Manish Boys and Davey Jones and the Lower Third. The latter three of these bands released singles, but none received much public attention. The rise to fame (or "fame") of British singer Davy Jones as part of the American TV series and pseudo-band The Monkees prompted the aspiring performer to alter his own name to David Bowie in 1966, taken from a style of knife designed in the 19th century by Colonel James Bowie. 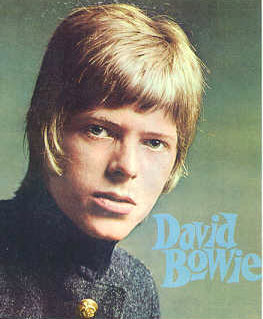 After signing on with manager Kenneth Pitt and releasing a trio of unsuccessful solo singles on the Pye label, a deal with Deram was subsequently arranged, and a collection titled The World of David Bowie (featuring the "psychedelic" novelty single The Laughing Gnome) was issued by the label in 1967. Bowie then temporarily abandoned his music career in order to spend several weeks in retreat at a Buddist monastery in Scotland, followed by several months of study with dancer/mime Lindsay Kemp; this led to the formation of his own short-lived mime troupe Feathers in 1968, and then the more ambitious Beckenham Arts Lab in 1969. With the intention of raising money for the Arts Lab, Bowie resumed recording in 1969, signing a one-album deal with Mercury Records. The single Space Oddity was released that July, it's use by the BBC in conjunction with their coverage of the Apollo 11 moon landing helping to push the song up to #5 on the British charts. An eponymous full-length album (titled Man of Words, Man of Pictures in the States) was issued in November, it's contents displaying a shift away from the music hall pop of his previous album in favor of the acoustic-based folk that had been growing in popularity since the arrival of Bob Dylan's first album in 1963. This approach was supplanted in its turn on his next album The Man Who Sold the World (1970), which adopted a heavier rock sound centered around the guitar stylings of former Rat Mick Ronson. Previous to this, the trio of Ronson, producer/bassist Tony Visconti and drummer John Cambridge donned superhero costumes and accompanied Bowie as The Hype -- the singer's inaugural plunge into what would later be labeled as "glam rock". By the recording of the album, however, Cambridge had been replaced by drummer Woody Woodmansey. Mick Ronson continued to work with Bowie as both guitarist and sometime arranger throughout the singer's rise to fame in the early 70s, with bassist Trevor Bolder and drummer Woodmansey comprising the rest of the core band during this period. After 1971's Hunky Dory (which featured the Bowie standard Changes), this trio became known as The Spiders From Mars, supporting the extra-terrestrial Ziggy Stardust character Bowie created for his 1972 album of the same name. Despite it's relatively brief duration, the Ziggy Stardust phase of Bowie's career proved to be the most enduring of all his theatrical devices, and the album one of his most popular. The Spiders' line up remained intact for the follow-up release Aladdin Sane (1973) and (minus Woodmansey) the covers collection Pin-Ups (also 1973). Bowie soon tired of his "glam" persona, however, and, after staging the public assassination of Ziggy Stardust at the Hammersmith Odeon in July of '73, sought a new direction and a new group of collaborators. For his next project, Bowie attempted to create a musical adaptation of the grim, totalitarian future decribed in George Orwell's 1949 novel 1984. Orwell's estate refused his use of the material, forcing the singer to adapt his ideas as Diamond Dogs (1974) -- realized on album with the assistance of Visconti, and as an extravagant stage show in collaboration with choreographer Toni Basil. The album proved to be a transition from his previous group of releases, and still retained some of the visual and musical style established with Ziggy Stardust; these vestiges were finally shed in mid-1974, when Bowie discovered his new source of inspiration in the distinctive soul and funk scene that had been developing in Philadelphia. The flamboyant glam trappings of the early 70s were exchanged for a more restrained approach, and -- with the help of former James Brown guitarist Carlos Alomar -- Bowie booked into Philadelphia's Sigma Sound Studios to created the funk-infused Young Americans (1975). Having relocated to Los Angeles after completing the tour in support of Young Americans, Bowie landed his first major film role as the lead in Nicolas Roeg's adaptation of The Man Who Fell to Earth (released in 1976). Images from the film would subsequently be used for his next two efforts Station to Station (1976) and Low (1977) -- the former album proving yet another transitional release, this time between the soul leanings of Young Americans and the German-avant-garde-influenced synthesizer explorations of the latter. Low would afterwards come to be regarded as the first in a related trilogy of releases (usually referred to as the "Berlin Trilogy") that also included "Heroes" (1977) and Lodger (1979), all three of which were realized in collaboration with music theorist Brian Eno and producer Tony Visconti. In the midst of these three, Bowie also took time to help revive the career of friend Iggy Pop by producing and contributing material to the albums The Idiot and Lust for Life (both 1977), as well as adding to his acting credits with a second lead role for the German-language film Sch�ner Gigolo, Armer Gigolo (1979) and a vocal performance contributed to a Philadelphia Orchestra recording of Peter and The Wolf. Following this deliberate hiatus from the mainstream, the arrival of the 1980s found Bowie integrating the musical approach he had been developing throughout the creation of his trilogy into a more accesible form of rock music (although this shift had already become somewhat evident on Lodger). The resulting blend placed the singer at the top of the British charts -- a position achieved both by his next album Scary Monsters (and Super Creeps) (1980) and its lead single Ashes to Ashes, whose lyric revisited the Major Tom character introduced in Bowie's breakthrough song Space Oddity. Not long afterwards, he returned to the number one spot with the track Under Pressure, recorded in collaboration with the band Queen. A period was then spent focusing once again on his acting career, taking roles that included the title characters in a stage version of The Elephant Man (1981) and the BBC-TV production Baal (1982), and significant contributions to the films Christiane F, wir Kinder vom Bahnhof Zoo (1982), The Hunger (1983) and Merry Christmas Mr. Lawrence (1983). An even more substantial concession towards mainstream pop music was made by the singer on his next release Let's Dance (1983), recorded in collaboration with producer (and Chic co-founder) Nile Rodgers; this record managed to surpass all of Bowie's past commercial achievements, earning him three more top 20 pop singles (Let's Dance, China Girl and Modern Love) and placing him amongst the most visible performers of the 1980s. Bowie attempted to recreate this success with the following year's Tonight, but -- despite scoring another top 10 entry in the form of the single Blue Jean -- the results were given a lukewarm response from both the critics and the general public. Bowie's considerable popularity had hardly evaporated, however, and both his appearance at the Live Aid festival in 1985 and a benefit single of the song Dancing In The Street (recorded as a duet with Mick Jagger) were given a enthusiastic reception. The next set of projects undertaken by the singer suffered from the same middling response as Tonight, although a loyal core of enthusiasts remained consistent in their support regardless. The films Absolute Beginners (1986) and Labyrinth (1986) did not fare particularly well at the box office or with critics, while the album Never Let Me Down (1987) and its elaborately-staged tour were both given a fairly rough treatment by the press. Seeking to break out of the "music biz" rut in which he had found himself, in 1988 Bowie initiated a collaborative partnership with guitarist Reeves Gabrels that ultimately led to the creation of the hard rock outfit Tin Machine with rhythm section Hunt and Tony Sales. An eponymous debut released in mid-1989 did help somewhat to restore Bowie's credibility, but more importantly it allowed him to clear some of the cobwebs from his musical life so that he could continue to develop as a performer. A more literal re-evaluation of his past was undertaken through the Sound + Vision retrospective box set and tour. One more studio offering from Tin Machine was issued in 1991, followed by the live collection Oy Vey, Baby in 1992. Neither fared particularly well, and Bowie subsequently dissolved the group to re-focus on his solo career. A reunion with producer Nile Rodgers on his first 90s solo offering Black Tie, White Noise (1993) once again emphasized Bowie's soul leanings, although the tracks updated this sound by integrating an unconventional take on contemporary dance and club music. Featured guests on the album included guitarist Mick Ronson, R&B singer Al B. Sure and jazz trumpeter Lester Bowie, as well as a writing and performing contribution form former Tin Machine bandmate Gabrels on the track You've Been Around. The soundtrack-derived album The Buddha of Suburbia (1993) served as yet another transitional effort, edging the the dance-oriented sound of Black Tie, White Noise towards the harsher, alternative rock sound that would be utilized on 1995's Outside; for this latter album Bowie once again enlisted the input of Brian Eno, resulting in his most unconventional recorded work since the "Berlin Trilogy" releases. The nascent drum-and-bass elements present on Outside were then given greater emphasis for his next album Earthling (1997). In 1998 Bowie expanded his business interests by launching the his own internet provider BowieNet, having used the medium the previous year to distribute the first download-exclusive single Telling Lies. The singer also set in motion the innovative idea of selling "Bowie Bonds", issued on the strength of his projected future royalties. Another shift in musical style was made evident on his next album hours... (1999), many of the tracks on which had originally appeared as part of the soundtrack for the video game Omikron: The Nomad Soul. Created in collaboration with Gabrels (who had also made significant input into Bowie's previous two efforts), the release marked the end of the decade-long creative relationship between the two musicians, as the more subdued direction that the music was taking was of little interest to the guitarist. Bowie once again turned to a producer from earlier in his career for the recording of his first 00s release Heathen (2002) -- the choice this time being old associate Tony Visconti. A entirely new set of musicians was brought in for the sessions, including the unconventional guitarist David Torn, session drummer Matt Chamberlain and, of course, Visconti himself. The Bowie/Visconti collaboration continued for 2003's Reality, in support of which the singer organized his first world tour of the new millennium; the tour had to be cut short due to health complications, but after a period of recuperation the singer resumed activity with recording projects and occasional one-off live appearances. A number of guest appearances on other artists' releases were made in the first half of the decade -- several of them also Visconti productions, such as the album Breasticles (2003) by remarkable singer Kristeen Young (who in turn appeared on Heathen) and No Balance Palance (2005), the fifth full-length release by Danish rock combo Kashmir. A vocal contribution was also made to Lou Reed's Poe-themed release The Raven in 2003. 40 Stansfield Road, Brixton, London, England.